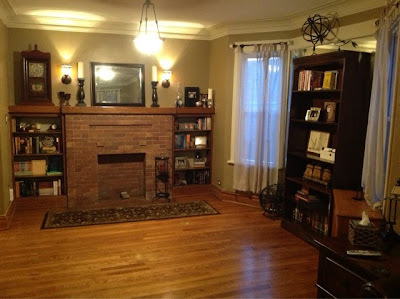 Our living room is a large rectangle, in most homes I think would be two separate rooms. One of our goals for the summer is to find the perfect furniture for it at garage or estate sales. I'm thinking of getting a fireplace insert or something like this for the fireplace. My thought is this should be a place were we can just curl up with a good book in the winter and watch the snow fall outside.